” The success of an organization is represented by the team that forms it. Strong women support other strong women, therefore the key to success stands in unity, team work, in mutual support. We all are aware that when it comes to a difficult mission, a woman is always capable of finishing it with success. I believe in the #entrepreneurialskills of #women and I think that, even if sometimes we can’t change the future, we can still change a bit every day with small but steady steps. We all need to believe that we can change the world because there is a need for change.Men have the duty to support and promote women, the same way we have been doing it. 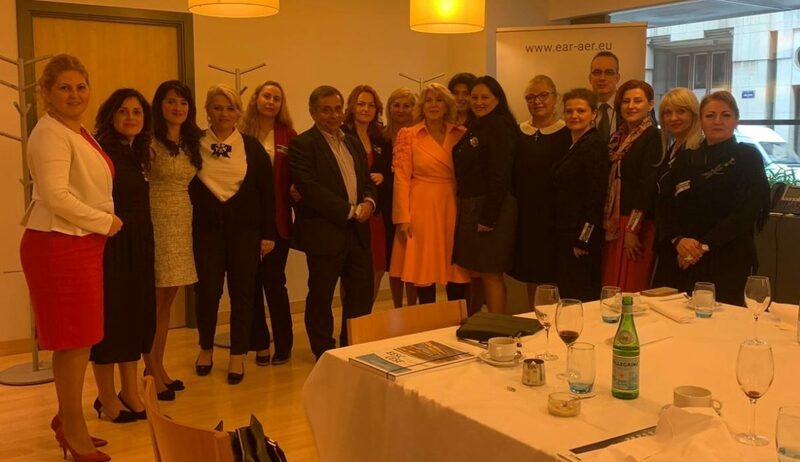 They have the duty to respect, love and protect women“, declared in her speech Madi Sharma, EAR Honorary member, member of Social and Economic European Committee in UK during the meeting with female entrepreneurs from CONAF Romania organised by EAR-AER on the 19th March at the EESC in Brussels.